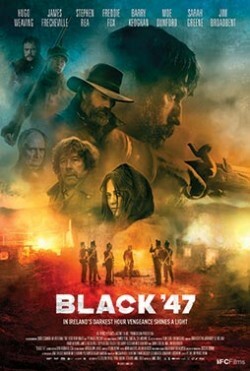 Essentially it is a kind of revenge western epic – imagine a cross between Clint Eastwood’s the “Outlaw Josey Wales” and Quentin Tarnatino’s “Django Unchained” – but set in Famine era Ireland. Think of “Rambo” in mid-19th century Ireland, with single-shot pistols and rifles (which more than once fail to fire), rather than automatic weapons. My wife and I attended a 2 December screening at the American Film Institute’s “European Union Film Showcase.” Irish Ambassador to the United States Dan Mulhall spoke about the Famine before the lights dimmed, and Jonathan Loughran, one of the film’s producers, participated in a Q & A session after the credits rolled. The Famine is “fundamental to any understanding of Ireland’s story,” Mulhall said, and also is the “origin story” of more than 33 million Irish Americans. With more than 1 million dead and 1 million emigrated, it was “a food crisis of unparalleled scale,” he said, the last mass hunger event in the Western world. Ireland’s population was 8.5 million at the time, a level not expected to recover until 2045, nearly 200 years later. Loughran, originally from Dublin, said working on the film “re-woke feelings I forgot” in leaning about the Famine as a child. He said reactions to the film have been better than expected, especially among the Irish. “It stoked some republican feelings in people,” Loughran said. He praised Australian actor James Frecheville, who plays former Connaught Ranger Martin Feeney, for learning Irish, which is spoken by various characters the film, their words either interpreted by others in the scene, or shown in subtitles. This entry was posted in Arts & Culture, History, Irish America and tagged Dan Mulhall, Great Famine on December 4, 2018 by admin.